Prashad is a vegetarian Indian restaurant in Bradford that got to the finals of the 2010 TV show (Gordon) Ramsay’s Best Restaurant. This is their recipe book, including some dishes from the restaurant and some from their home. 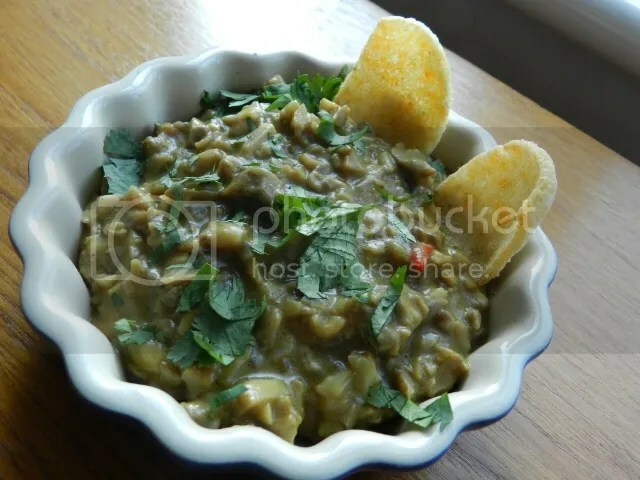 The recipes are divided into: Starters; Street Snacks and Nasto; Main Dishes; Rice and Breads; Soups, Pickles, Side Dishes, Chutneys and Dips; Drinks, Desserts and Sweets. There are also sections to explain the spices and ingredients that may be unfamiliar to the average reader. The book is well laid out, with clear instructions and many full page, colour pictures of the finished dishes. The recipes are about evenly split between the sections, which means the rice and breads section is a bit overbalanced for me. I can’t see me making many of breads, so I would have preferred more recipes in the soups side. There are only three soups listed, which is a bit disappointing, but I suppose soups don’t sell that well in restaurants. And this is my main comment about the book. It is clearly written by someone who runs a restaurant. I always find there is a different feel to recipe books written by chefs to those written by cooks. The chef books always seem to have more complicated recipes with more ingredients, more steps and more utensils needed (someone else does the washing up!) This book definitely falls into that category. There’s also an unwillingness to compromise over ingredients. There are many specialist ingredients in this book some of which you will be able to find in the world food shelves of a big supermarket and some you’re going to have to track down an Indian grocer for. Having said that, the book does explain what you need, what it looks like and how to prepare it. Grumbles aside, there are some great recipes in this book. There are dhals and vegetable curries a plenty, with rice dishes and pickles to serve with them. 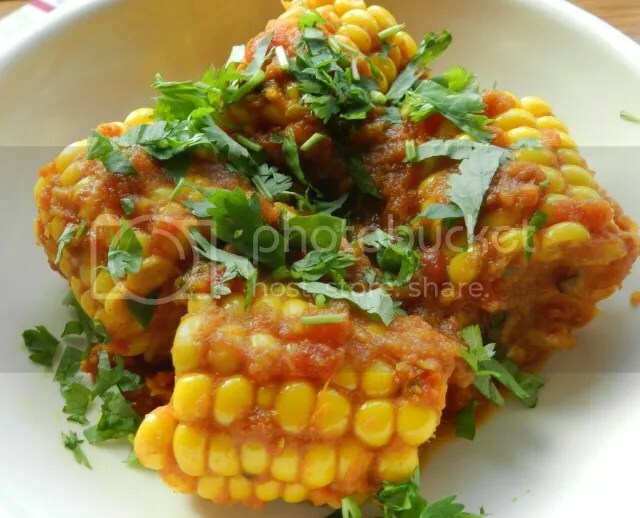 The recipe I made below, corn on the cob curry, is delicious hot and spicy with the sweetness of the corn coming through. I will certainly be making it again. Make the masala paste by blending the chillies, ginger and salt in a blender. Heat some oil in a large pan and add the onion paste. Cover and leave to fry gently for 3 minutes until the paste is starting to brown. Stir in the chopped onion. Cover the pan and fry for two minutes and then stir. Repeat until the onions have turned a rich dark brown. Add the masala paste, tomatoes, salt, chilli powder, turmeric, ground coriander, ground cumin and half the fresh coriander. Stir thoroughly and then cover and leave to simmer for 2 minutes. Add 175ml of boiling water and the corn on the cob pieces. Make sure the corn pieces are covered in the sauce, cover and let simmer for 20 minutes. When the corn is tender, remove from the heat. Stir in the garam masala and the rest of the fresh coriander. Serve with flat bread to hold the corn and mop up the juices. This is another mid-week recipe. 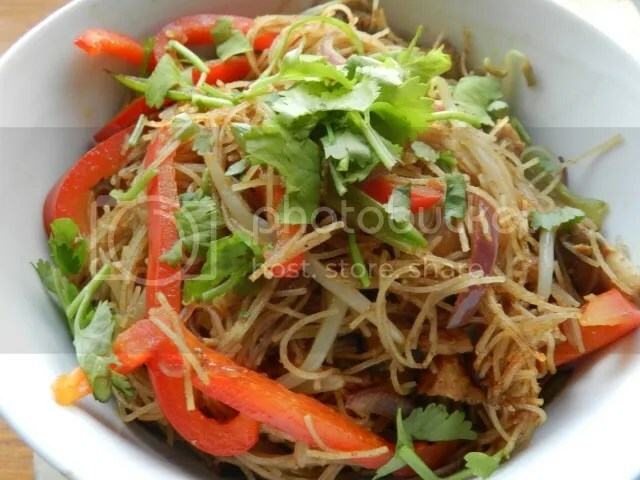 You can spot these because they use curry powder and pre-cooked noodles. This recipe uses two ingredients that are fast becoming staples in my kitchen: coconut milk and fresh rice noodles. There are a lot of vegetables in this dish, some cooked in the coconut and curry broth and some added as it is served. This is really quick and really tasty. You can ring the changes depending on what you have in the fridge so it is endlessly adaptable when you don’t have time to shop. Heat some oil in a large saucepan and add the tofu. Fry for a few seconds and then stir in the curry powder or paste. Make sure that the tofu is coated in the spice mix and let it cook for a few minutes. Add the coconut milk, vegetable stock and soy sauce and bring to a simmer. Stir in the noodles, bean sprouts and sugar snap peas. Bring back to the simmer and let cook for a minute. You’re not actually cooking anything, just heating things through. Just before serving, turn off the heat and stir in the lettuce. 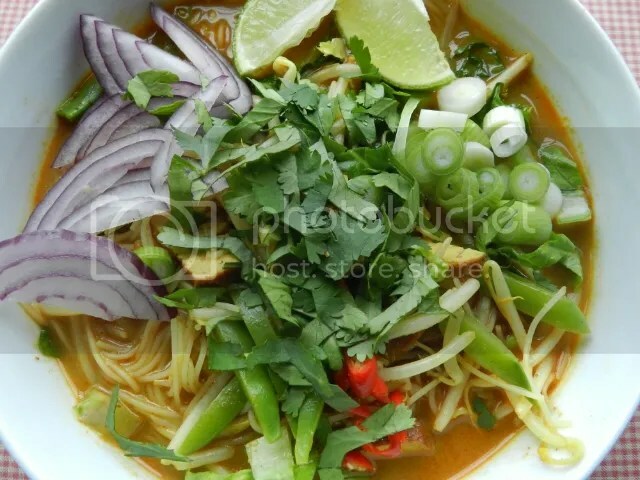 Serve in a large bowl with the red onion, spring onion, chilli and coriander placed on top as a garnish. Add a lime wedge for squeezing. Spinach is one of those vegetables you’re supposed to hate as a child and maybe get to like as you grow older. I didn’t hate spinach as a child because I never ate it. I think it was my Dad that hated it even as an adult and it just never appeared on our table. I think the first spinach I ever ate was the baby spinach leaves in a salad. I don’t tend to eat it cooked as a side-dish, but as an ingredient in other things. 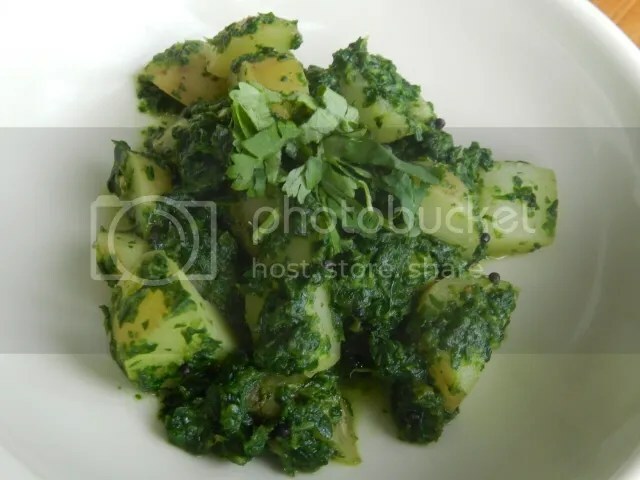 And one of my favourites is Saag Aloo, the Indian restaurant favourite of spinach and potatoes. 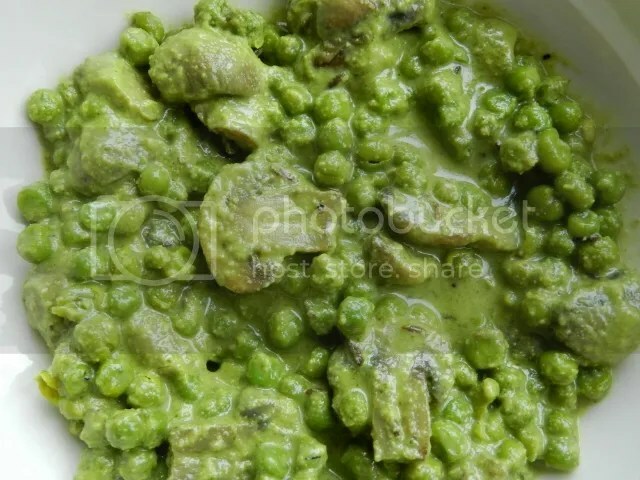 I love it, but it tends to be very oily in restaurants and what I wanted to do was see if I could get the same flavour but without the fat. I based my flavours on this recipe, but instead of frying the potato at the start, I added some water to boil them. If you keep the lid off the pan, most of the water disappears so that you get a dryish dish rather than soup. This has plenty of punch. I say it serves two, but I can eat a pan of this to myself! When it’s hot add the mustard seeds and watch them spit and sputter for a few seconds. Then add the chilli and garlic. Once the garlic is starting to brown, add the potatoes with the cumin and coriander powder. Add the water and bring to the simmer. Simmer uncovered for about 10 minutes or the potatoes are nearly cooked. Add the spinach, stir and then cook for 5 more minutes. 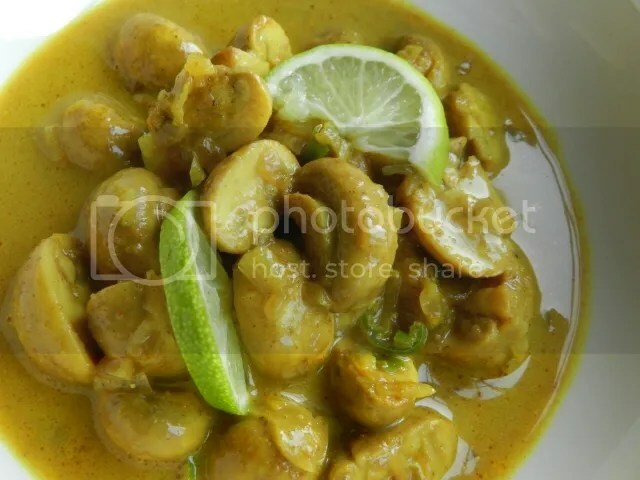 Serve with the coriander leaves sprinkled over the top.